Green build 2016, LA Convention Center. Owned and operated by Informa and presented by the U.S. Green Building Council (USGBC), Greenbuild attracts 20,000-plus attendees and more than 500 exhibitors each year from across the green building sector—including commercial and residential professionals, educators, architects, building owners/operators, students and advocates. 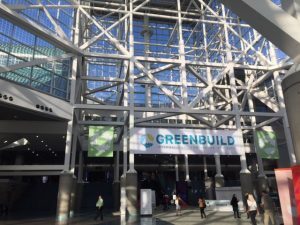 In its 15th year, Greenbuild continued to celebrate and share the ideals and passions of the green building community of yesterday, today and tomorrow. “When we think of icons, we conjure up images of people, places and things that withstand the test of time, symbolizing our beliefs, culture and community,” said Rick Fedrizzi, CEO and founding chair, USGBC. Keeping the iconic theme alive, Greenbuild 2016 speakers included famed architect Bjarke Ingels, renowned author and journalist Sebastian Junger, and USGBC’s own Mahesh Ramanujam, who will replace Fedrizzi as CEO next year. Topics ranged from social sustainability to transparency to technology. Advancements in technology often spur industry innovations. One of the most prevalent unveilings at this year’s Greenbuild was the announcement of Autocase, a joint venture between USGBC and Impact Infrastructure. In short, Autocase is an automated business case software for green design created to help the A&D community prioritize investments to meet the requirements of the owner, improve the health and productivity of occupants and create value for the community and environment. The web-based tool analyzes and reports bottom-line values—economic, social and environmental costs and benefits—of infrastructure projects. Teams can then assess the triple bottom line impact of design changes immediately and use the information to increase their chances to win financing and buy-in from the community. While materials still top the charts of most discussed topics on Greenbuild’s exhibit hall floor, the focus has shifted. 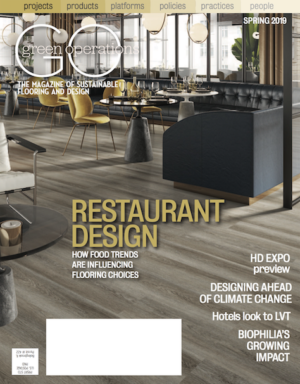 Where the reduce, reuse, recycle trifecta used to act as the end-all, be-all when specifying flooring, retailers, architects, designers and consumers alike want to make the right decisions when choosing an ecologically sound product today. Answering the call, many mills are finding ways to have a more transparent dialogue with consumers. “The green building community has continuously been asking for Red List free products, and we responded,” said George Bandy, Mohawk’s vice president of sustainability. Mohawk Group participates in the Living Building Challenge Declare program to provide “nutrition labels” for more than 500 of its building products. The aim is to fill the information gap that exists today by answering three simple questions: Where does a product come from? What is it made of? And where does it go at the end of its life. Interface’s Climate Takeback focuses on reversing negative impacts on environment, climate. 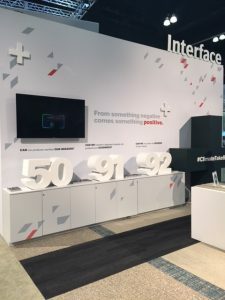 Similarly, Interface shared details of its latest mission, dubbed Climate Takeback, which it launched earlier this year at NeoCon. With this charge, the company is looking to foster more transparent conversations around four big changes: 1. Only take what can be replaced; 2. See carbon as a resource; 3. Restore nature’s proven ability to cool; and 4. Revolutionize industries.